The purpose of Facebook’s Mobile App Ads seems pretty clear — they’re supposed to drive installations, right? Well, in a new blog post, the company says its ads can now help with what comes afterward, namely, keeping users engaged and active (and in some cases encouraging them to spend money). To illustrate the challenge on the mobile side, Facebook cites a Localytics study that found that 66 percent of app users will only open an app between 1 and 10 times. The idea of re-engaging users is a familiar one in online marketing. 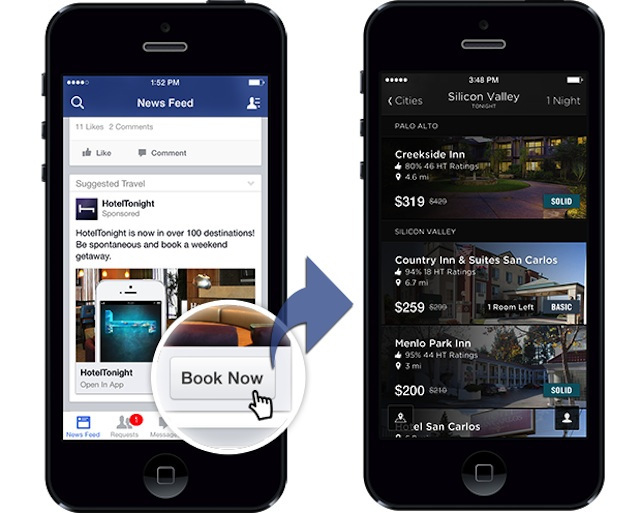 For mobile apps with ads on Facebook, that can now take form of targeting users who have already installed the app and then presenting them with custom calls to action. The options include general actions like “Use App” and more specific ones such as “Shop Now,” “Book Now,” or “Listen Now.” Behind the scenes, an advertiser can deep link to a specific area in the app itself. A Facebook spokesperson noted that the new calls to action should make the ads more tailorable to apps beyond gaming (as suggested by examples above). They also said this won’t change the way the company charges for the ads. According to the blog post, Mobile App Ads (which launched about a year ago) have driven more than 145 million installs this year for advertisers including Target, eBay, HotelTonight, and Kabam. And mobile ads, of course, have become a major driver of Facebook’s growth.